America's #1 Best Most Robustly Built Long-Gun Weapon Light Designed For ALL Heavy Recoil Hunting Calibers. No Other Light Can Compare! Almost every long gun “weapon light” made by the majority of brands in production today, in reality, were only designed for the recoil of a .22 cal rifle. You can spend $50 bucks or $1500, but the quality of those lights are virtually the same. Simply open up the battery housing and you will find grampa's bed-spring, and that the batteries sit up against a circuit board, with no recoil-absorption systems, and at best another small spring or stamped pin. Those poor quality excuses for long-gun “weapon lights” will not survive long at all, and are made for the weekend shooter who occasionally fires off a round or two. For the serious veterans who want combat-duty hard-core mil-spec quality that won’t let them down in the line of duty, they’ll buy a Colt. 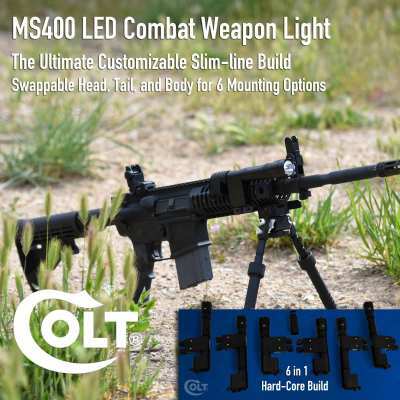 The Colt 400 Lumen 2AA MS400 is one of the most robustly built active-duty weapon lights in modern day history. Even on a shot-gun shooting magnums, it won’t even flash from the recoil. With lights able to stand up to 35,000 rounds of continuous fire without failure, Colt Weapon lights are for the serious shooter who refuses to settle for the common toy-lights sold by so many other brands. Open the housing of a Colt weapon illumination system and a quick side-by-side comparison will speak volumes. Colt lights are absolute works of solid-built art with uncompromisingly robust builds never seen in the tactical industry. The modern S.W.A.T. 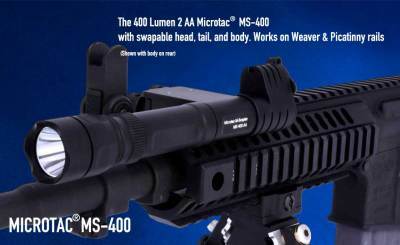 officer to the active Marine, will appreciate the swappable head, tail, and body, making the MS400 and MS200 among the most customizable and modifiable weapon lights on earth. And the fail-proofed remote plug jack allows for a remote switch (Sold Separately) to instantly plug in providing both on/off and momentary function. When Quality Counts…Compromise is Not and option…Buy a Colt! 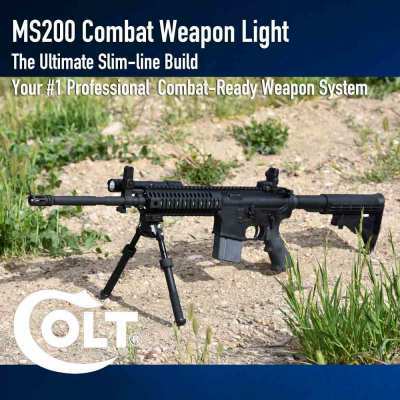 The Colt 200 Lumen 2AA MS200 is one of the most robustly built active-duty weapon lights in modern day history. Even on a shot-gun shooting magnums, it won’t even flash from the recoil. It's late in the evening in the forests of Texas. The sounds of grunting and snarling can be heard off in the distance, and by the noises alone, you know that the number of them, are more than a few. The slightest noise will set the whole heard to a charge. You switch on your light, and a clean clear green beam illuminates 7 of the largest hogs in the county, and not a one of them is spooked by the light. You've taken your shot and the target has made his last move. In seconds your job is done and the hunt is over. You're in "The Hot Zone", and you're packing the Colt PGS200 Predator series. When you want the perfect hunting light for the weekends, and an awesome white weaponlight for the weekday patrols, the PGS200 is the weaponlight of choice. The quality and build is that of lights 4x's the price, but you've made the right choice. With dual recoil absorption springs, and a quick-socket for remote switch plugin, the PGS200 is the ultimate light for your hard hitting, heavy recoil long guns. And with an intensified projection beam amplified by a machined aluminum optic, and computer regulated circuit powered with just 1 AA battery, you'll never need to worry about where to find batteries for your high-powered gear. 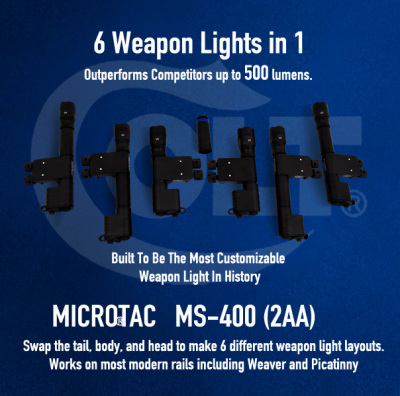 Colt Weapon and Tactical lights are designed for Hard-Core Mil-Spec needing grunts who's gear must not fail. When your working in the "Hot Zone" don't trust anything less...Pack a Colt. 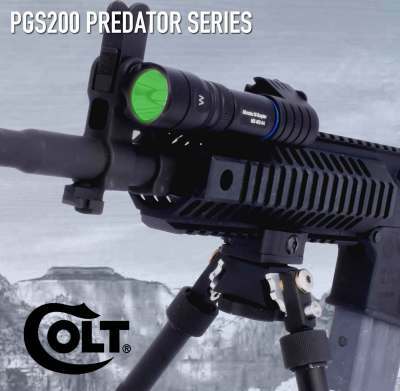 entire animal for perfect use with high-powered scopes and targeting systems, the Colt Microtac™ Predator™ PGS 100 is the ultimate illumination tool for all predator applications. And with the included White LED head, you can quickly transform your predator system into a white light for home-defense and LE applications. One mode-operation eliminates accidental switching of modes during recoil events as happens with many other predator systems. As is the case with all Colt integral mount weapon lights, the sleek slim-line design means that the light never needs to be removed from your rifle.